Stable Doors are both aesthetically pleasing and practical. Comprising two separate sections, your newly-installed door will allow you to control how you manage your space. Find out more by talking to us today. Stable doors operate in a unique way. Comprising two independently operated sections, they can keep your home safe and well-ventilated at the same time. Our composite stable doors are manufactured by Solidor: an innovator and market-leader in the home improvement field. We are confident that when you choose us for your stable doors your installation will meet your design expectations. The Fox Windows team will work with you to ensure your stable doors perform and look the way you need them to. We’ll help you choose the right colour and textures – and the best accessories. Contact us for advice. Another advantage of the two independent panels in your door is that you can choose to keep your room cool during the summer, but leave the cold air outside where it belongs when winter sets in. This is an extremely versatile stable door that will give you control over your home environment. Fox Windows and Doors install the Solidor range of stable doors. 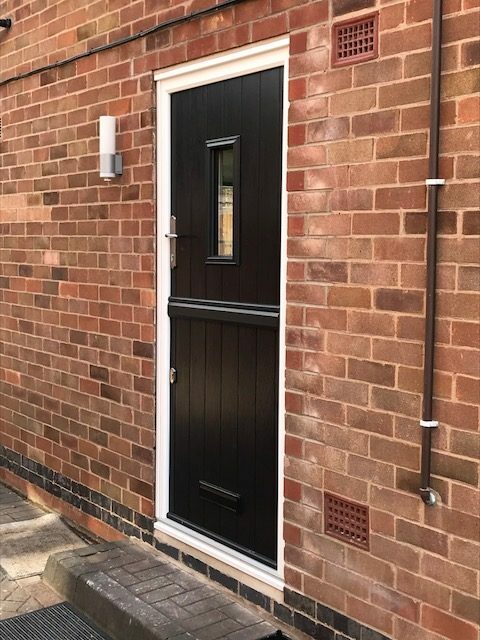 These attractive doors are manufactured using a solid timber core which is obtained from a sustainable source so as to reduce the impact on the environment. Solidor stable doors are truly solid, 48mm thick, 10% thicker than the nearest competitor meaning it is a genuinely high quality product. The unique design of your stable doors is bound to catch the interest of friends and family who come to visit. Further enhance the appearance and performance of your Solidor doors by choosing from our range of colours, hardware and accessories. You’ll be able to buy from us with confidence, knowing that your installation has been designed with the environment in mind. We have years of experience within the home improvement industry and are experts in the installation of composite stable doors. Your stable doors are available with an advanced multi-point locking system that will block almost any access attempts by intruders. Because your installation features two independently functioning sections, you’ll also be able to deter trespassers by barring their access while you are out of the room. Stable doors can be used anywhere in your home. Because they are extremely secure, you can use them as a front entrance. They look just as good when used as back doors – either leading directly from your home into the garden, or as part of a conservatory, orangery or house extension design. If you have a young family, you’ll want to ensure your children are safe when you’re out of the room. By opening the top section of your door, you can ventilate your room without worrying about them escaping. At the same time, your doors will act as a deterrent against intruders. During the warmer months, your stable doors will come into their own. Let in passing summer breezes that will stop your home overheating – a factor that might otherwise lead to condensation or mould. When friends or family come to visit you can open both sections to allow access to your garden. Composite stable doors made by Solidor and installed by Fox Windows look stunning. They also offer a range of benefits, including beautiful frame options, a wide range of accessories and high security locking systems. These factors, when combined, will make your home more appealing to prospective vendors if and when the time comes to sell. Choose stable doors if you want a versatile product that can be used anywhere and for more than one purpose. Get a quote today! For the cost of your stable door installation in Kenilworth, Leamington Spa, Warwickshire and surrounding areas, contact us today. Explore our stable door range or contact a member of our team with your questions. We can provide guideline prices over the phone and arrange to come and see you for an informal discussion about your requirements.